A university is offering a free iPhone application it has developed to help students starting their first term. The University of Central Lancashire in Preston says the mobile phone service will provide maps and details of entertainment and local transport. There will also be details of campus facilities and access to students' university e-mail accounts. Director of learning, Michael Ahern, say this will help connect with students who "lead very busy lives". He believes this is the first such iPhone application for a university in the UK. "At the beginning of term you're always being stopped by students asking for directions, now they're going to have the information they need in their pockets," says Mr Ahern. "As they roam around the campus they can get information about lecture theatres, places to eat and libraries," he says. The mobile phone service links to an alternative student guide, written by fellow students, and can also access student union services, such as letting students book tickets for bands. Students are increasingly likely to be studying part-time - or to have term-time jobs - and Mr Ahern says that a mobile phone is a convenient way for the university to keep in touch with busy people in many different locations. "It's a different track for reaching students," says Mr Ahern. But he says that there is a question about the lack of access for students who do not have iPhones - and although not wrapped into a single package, the same information can be accessed through laptops and other mobiles which can access the internet. The university has just invested a £1m in laptops and online access for students who cannot afford their own computers, he says. 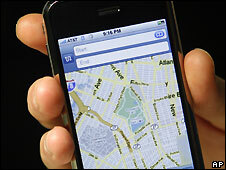 The iPhone "applications" are customised information services which can be downloaded onto this type of mobile phone. It has been estimated that there will be 100,000 applications available by the end of the year, with 1.8 billion having been downloaded so far.